White Knight Noel (WKN) fits into a niche role of Mage/Tank quite nicely. I think of him as being the counter-magic version of Demon Rain, which was another global exclusive unit. WKN is a versatile unit and offers a decent tank alternative to those without a Cecil right now and while WKN can’t be a 2nd healer, he does bring some decent offensive abilities and could also take on the role of mage if the situation requires it. • Blizzaga (Ice magic damage (1.8x) to all enemies), standard ice magic. Ice Rosetta (Statistics: Type: Accessory, Stats: DEF+50, MAG+50, Resistance: Ice (+25%)), while it may not be the absolute best TMR for mages or for tanks it’s decent for both. For mages it’s a nice boost to their defense stats which are many time lacking, for tanks it could help with their healing since MAG does contribute slightly to that and whenever it’s needed +25 Ice Resist is solid enough itself. Silver Curtain (Base: Increase DEF/MAG (50%) for 3 turns and recover MP (30) to all allies – Max: Increase DEF/MAG (74%) for 3 turns and recover MP (30) to all allies), decent limit break from the stat increase alone and the +30MP to all allies (including White Knight Noel) makes this top notch especially for mage teams that do explorations, once again solidifying WKN’s position as the Mage’s Tank. Verdict: White Knight Noel may have been the Knight in shining armor your team was looking for. 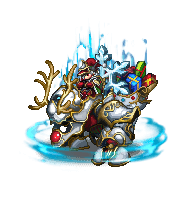 Mages for some time now have taken a back seat to melee units (probably because there’s only one 6-Star mage unit right now) but if you happen to have a team of Exdeath’s and hoping for some soon to be released Majin Fina’s then White Knight Noel may be the best tank for your team. Decent tank, decent TMR, all around good tank, not as versatile as Cecil, but very solid, can dual class very well, just needs Dual Cast to be competitive with other top tier mages. 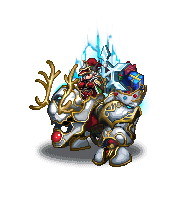 White Knight Noel has bonus +25% resistance to Ice, and Wind and -50% Fire resistance but is neutral to all other elements and status ailments. A knight known for his generosity and nobility. Always seen riding atop a gold and white robot, he is known by people as the “White Knight.” When war broke out between two neighboring countries, the homelands of his parents, Noel gave up his life to defend the powerless from the soldiers. Tales of his brave sacrifice quickly spread, eventually leading to the end of the war. After his death, residents of the two nations celebrate the Festival of the White Knight annually to remember him and to remind themselves of the importance of peace.